Quantum particles can be divided into two types: fermions and bosons. When cooled down to near-absolute zero temperatures, bosons can condense together into a collective state of matter called a Bose-Einstein condensate where they occupy the same quantum state (e.g. same place and velocity simultaneously). This state of matter allows us to observe remarkable phenomena such as superconductivity – the ability to conduct electric energy with zero resistance. One of the greatest challenges in physics has been to realistically create a Bose-Einstein condensate using photons, which would have significant applications in laser and even solar panel technology. Publishing in Physical Review A, a PhD student at EPFL has developed a realistic theoretical model for condensing photons in three-dimensional space. A long-standing question in physics has been whether or not photons – the particles that make up light – can be condensed. The main obstacle is that photons actually have no mass, which is a key requirement for a Bose-Einstein condensate. A proposed solution is to use an optical cavity, which can confine light between two parallel reflective sides, which makes photons behave as if they have mass. However, the straight sides of the cavity allowed light to "leak" out and escape. In 2010, a paper showed experimentally that photons could be permanently trapped in a cavity with curved sides instead of straight ones. This created a "trapping potential" that kept photons from escaping. But though groundbreaking, developing a much-needed theoretical model from this experiment has always been problematic because it assumes that the whole system is two-dimensional and that the medium between photons (it cannot happen in air) does not affect their condensation. 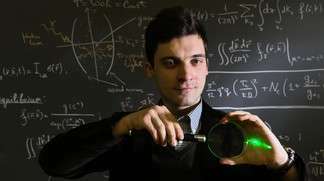 Alex Kruchkov, a PhD student at EPFL, developed a mathematical model for condensing light in three-dimensional space and under realistic conditions. Building on the previous models, Kruchkov took into account the medium inside the cavity and the way it would affect the behavior of trapped photons. In addition, he extended the model to consider Bose-Einstein condensate statistics for three-dimensional conditions. His theoretical model of photon condensation corresponded to experimental measurements and demonstrated that light energy can be accumulated in a Bose-Einstein condensate state. The new model offers a more complete theory of photon Bose-Einstein condensate, which is a new and exciting area of physics. In addition, this phenomenon was observed at room-temperature, which makes it much more accessible to technological implementation than the ultra-low temperatures required for BEC of helium-4 (superfluidity) or laser-cooled atoms. Practically implemented, photon BEC could be applied to develop the next generation of lasers. More information: A. Kruchkov, "Bose-Einstein condensation of light in a cavity," Phys. Rev. A 89, 2014 (accepted; to be published); preprint: arXiv:1401.0520. The stationary wave generated within a laser cavity is a conensate of emitted photon-waves which form a SINGLE macro-wave. And it does it at room and higher temperatures. It is questionable to call it a Bose-Einstein Condensate. One can do the same when extracting electrons from a highly doped n-type conductor into the vacuum by means of an anode. The electrons form a SINGLE macro-wave at room and higher temperatures. And, oh yes, charge can be transferred through this condensate while there is not an electric-field within it. It superconducts. The condensates formed within materials like the low temperature metals and the ceramics, which superconduct, are not modelled by Bose-Einstein Statistics, but by Boltzmann statistics. Reference to this experiment please.